"Our statue is a way of saying thank you to Hamish for being so perfectly adorable and to celebrate him and the joy he brings us." There is perhaps nothing quite as confounding as the study of values. Whereas it is precisely life, beauty, and nobility of soul that should be cherished, society turns the natural order of things on its head and instead wallows in their polar opposites. Even more disturbing, the thorough corruptness of organized living makes it all but impossible for most individuals to even recognize, let alone honor, those values and creatures that are truly worthy of being treasured. "...the world goes its way past all who will not partake of its folly," is how Ted Dreiser summed up the dilemma in his 1900 novel, Sister Carrie. One of mankind's most outrageous offenses has been his systematic abuse of cats. Even when he has not been busily abusing and exterminating them in droves, his treatment of them has been characterized largely by indifference and gross neglect. That even has been the cruel lot imposed upon those members of the species who have been blessed with loving guardians. For the most part, they too have lived out their brief sojourns upon this earth in obscurity only to have been consigned upon their deaths to unmarked graves in either landfills or backyards. Such is the sad and cruel fate of these exquisite beings who ask so very little of mankind but yet receive even less in return. 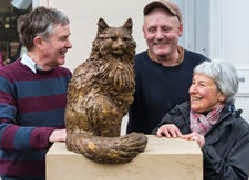 Recently, the citizens of St. Andrews took what appeared au premier coup'doeil to have been a small step toward breaking with that centuries' old tradition of neglect, belittlement, denigration, and abuse by immortalizing their fifteen-year-old resident feline, Hamish McHamish, in bronze. Largely due to the efforts of Flora Selwyn, editor of St. Andrews in Focus, £5,000 were raised through private contributions. 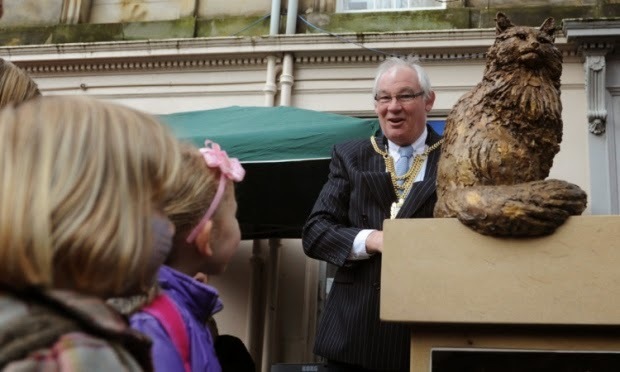 The project soon won the endorsement of the Fife Council and sculptor David Annand of Kilmany was commissioned to take Hamish's measurements as to prelude to fashioning a likeness of him out of bronze. Local stonemason Colin Sweeney was prevailed upon to assist with the project and the finished product was unveiled atop a stone plinth in Church Square on April 5th. 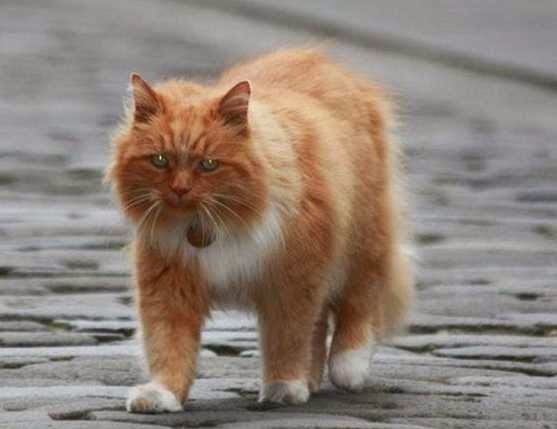 Given cats' legendary disdain for both crowds and ostentatious displays of affection, the handsome longhaired orange and white cat had to be shanghaied into putting in even so much as a cameo appearance. The honoree's shyness did absolutely nothing however in order to dampen the mood of those in attendance and the celebration proceeded as planned in his absence. In particular, students Hannah Holmes and Rosie Hanlon of the St. Andrews Opera treated the crowd to a performance of Duetto buffo di due gatti which is usually, although perhaps erroneously, attributed to Gioacchino Rossini. The students were followed by, appropriately enough, the Alleycats, a six-piece band that specializes in 1950's rock and roll. Retired BBC producer Marianne Baird, who irresponsibly had turned loose Hamish to roam the forbidding streets of St. Andrews at the tender age of one-year, had the unmitigated gall not only to show her ugly mug in public but to bask in the glory that rightfully belonged exclusively to Hamish. "I can't really get over it," she gushed to The Courier. "All I did was get a kitten." Baird's simply outrageous dereliction of duty as Hamish's guardian has been compensated somewhat by Selwyn's advocacy on his behalf. Not only was she the prime mover behind the statue but she also has championed his cause for years in her magazine. "What a special lady this is!" Leishman said of her according to the account in The Courier. "Without all her determination and hard work, this would not have happened today." For her part, Selwyn's original intention appears to have been limited to paying homage to a remarkable cat. "Our statue is a way of saying thank you to Hamish for being so perfectly adorable and to celebrate him and the joy he brings us," she told The Scotsman of Edinburgh earlier on November 8th. (See "Statue to Be Made of St. Andrews Cat Hamish.") "It has been a very popular idea. Hamish is a wonderful animal." Over the course of the intervening months, however, she appears to have fallen victim to the familiar siren call of the almighty shekel. "I hope it will be a big attraction. It'll be a nice change from golf and universities," she declared in an undated video posted on her magazine's web site. (See "Hamish McHamish Unveiling. The Cool Cat Around Town.") "It'll be an added bit to the town I hope." The erection and unveiling of the monument also sets up a rivalry with Edinburgh which in 1873 immortalized Grayfriars Bobby, a Skye Terrier, who allegedly spent fourteen years watching over the grave of his owner. Unfortunately for him, the citizens of Edinburgh did not get around to publicly recognizing his fidelity until a year after his death. "It is lovely that we will have a rival to Greyfriars Bobby," Selwyn told The Scotsman in the article cited supra. "It will be one-up for St. Andrews." 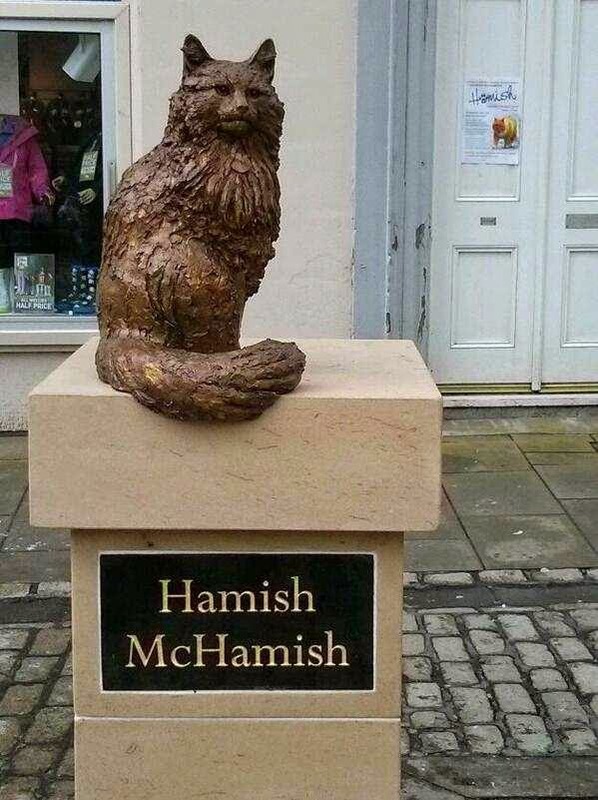 Long before anyone ever thought of sculpturing a statue of him, Hamish already was famous thanks in no small part to Susan McMullan's 2012 book, Hamish McHamish of St. Andrews. Cool Cat About Town. Now, he also has in excess of six-thousand followers on Facebook plus a Twitter account. Wikipedia has a page devoted to him and he has been featured on the BBC. Furthermore, once news of Selwyn's plans to honor him were picked up by the Internet and world press he was transformed almost overnight into an international celebrity. Like several other felines who have gone on to achieve world renown, a fair amount of legend and superstition also have grown up around Hamish. For example, both locals and visitors often rubs his bronze paws for good luck. Some residents of St. Andrews even consider it to be a portent of evil tidings to so much as give him the cold shoulder. "The legend is if you don't let him into your home and feed him you will have bad luck," Selwyn testified to The Scotsman. 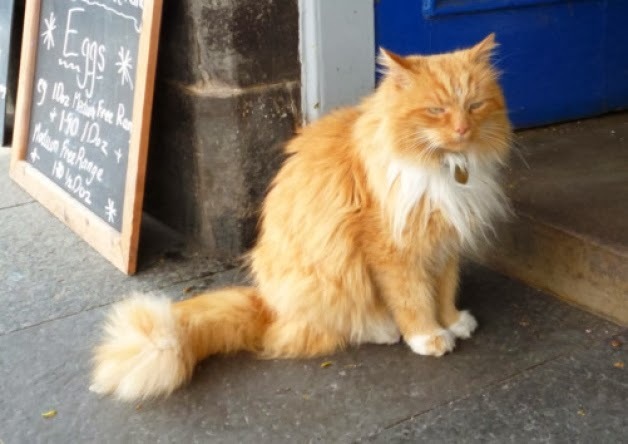 In spite of all the declarations of love and the memorial itself, there can be no denying that living on the street for the past fourteen years has taken a heavy toll on Hamish. Most noticeably, all the pain, suffering, and deprivations that he has been forced to endure are written in his sad, watery green eyes. He clearly is a cat who has seen much and suffered mightily from the slings and arrows of adversity. His unkempt mane is another glaring example that he suffers from severe neglect. All cats, but especially longhairs, need to be brushed on a daily basis. Doing so not only stimulates the growth of their coats but removes loose hairs and other particles that otherwise would be ingested during their incessant grooming. Parasites also need to be promptly removed from his coat and minor scrapes and bruises treated. A fulltime and attentive guardian additionally would be able to detect and respond to far more serious maladies that a casual observer from the community simply would either overlook or ignore. 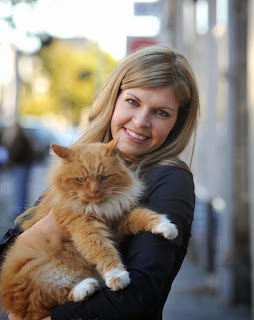 According to press reports, the only known contribution that Baird makes to his welfare is an annual veterinary checkup. Beyond that, she apparently could care less whether he lives or dies. "When he started to wander around, he used to go to Greyfriars Garden at night because it was a good hunting ground. I would call him and carry him home," is how she rationalized her decision to abandon him to The Courier. "If he didn't want to come home, he would jump over the wall. But more and more, he would just jump over the wall." From all of that she has arrived at the self-serving absurdity that "he's an amoral cat." It quite obviously would be asking far too much of someone like her but before she takes that long ride on the dragon she ought to for once have a good hard look at herself in the mirror and in doing so she might actually get a clue as to the difference between moral responsibility and its opposite. More to the point, her analysis of Hamish's behavior does not make much sense. Generally speaking, toms roam only in order to locate sexual partners. Even then they usually return home for food and shelter. Since press reports have failed to disclose whether or not he has been neutered, it is not possible to determine why he is still roaming at his advanced years. It is strongly suspected, however, that he has been forced into eking out a meager existence on the street because none of the town's almost seventeen-thousand residents has enough compassion and decency to provide him with a secure, warm, and loving home. That petit fait alone casts an entirely different light on the words and actions of Baird, Selwyn, Leishman, McMullan, and everyone else even remotely connected with Hamish. Instead of praise, the entire lot of them should be stripped naked in Church Square and treated to the pleasure of having a cat-o'-nine-tails raked across their fat, bourgeois backsides. Such an expedient might also sweat out some of the Johnny Walker that flows so freely in their veins and arteries. If not that, it surely ought to be sufficient in order to, at least temporarily, take their minds off of the Scottish national pastime of penny-pinching. In the face of Baird's total abdication of her moral responsibilities to him, Hamish has been forced by necessity to assume the rôle of a threadbare hobo and thus to rely upon handouts from the community for his daily sustenance. Specifically, he is known to have been befriended by, inter alia, Sue Ryder's Charity Shop at 109-A South Street and the law firm of Pagan Osborne at 106 South Street as well as Dynamic Hair. He also is fed by some of the University of St. Andrews' nearly eight-thousand students but when the undergraduates leave town for the summer his weight is said to plummet precipitately. That in itself is a pretty strong indications that he is not receiving regular meals. Securing shelter is another concern and on that vitally important subject press reports are inexcusably silent. On the plus side, St. Andrews is blessed with a surprisingly mild climate for a city that is situated so far north. In particular, overnight readings generally average in the low-30°'s F. during the wintertime. It is dark outside for up to as much as eighteen hours a day during that period, however, and that makes for some awfully long nights. Under such hellishly cold, dark, and rainy conditions, it is indisputable that Hamish deserves to be indoors curled up beside a blazing fire and with a reliable supply of good-quality cat food, a platter of herring, and a saucer of thick cream always on hand. In fact, it is nothing short of amazing that he has been able to endure so many wicked winters without contracting a fatal respiratory infection. In addition to the daily de rigueur of securing food and shelter, Hamish is prone to all the perils that afflict homeless cats everywhere. First and foremost amongst these are the machinations of motorists. For whatever comfort it may provide, Selwyn insists that he understands the rules of the road. "He is so clued up," she averred to The Scotsman. "When you watch him cross the road he waits for the lights to change." Just as it is the case everywhere, dogs in St. Andrews pose a potentially lethal threat to Hamish's continued existence. For example, toward the end of January he was chased up a tree by a pair of them. Luckily, he was unharmed on that occasion but the unprovoked attack necessitated that he had to be rescued with a ladder by local students and employees of a beauty parlor, presumably Dynamic Hair. That close call with disaster also prompted Leishman to issue a plea to dog owners to keep their charges under tighter control. "We've got to protect the old boy. He's getting on. I would ask dog owners to please keep their animals under control and on a leash when around Hamish McHamish," he told the Daily Record of Glasgow on January 30th. 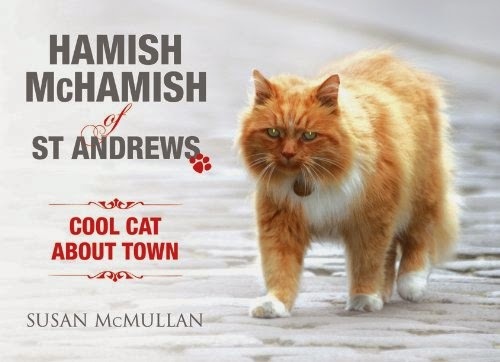 (See "Provost of Fife and Dunfermline Legend Jim Leishman Wants to Protect Scotland's Most Famous Cat Hamish McHamish.") "We've got to make sure he's not upset. 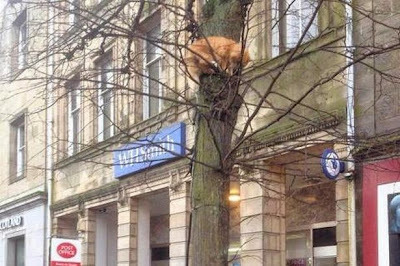 He is Scotland's most iconic cat, after all." Whereas Leishman's comments are a step in the right direction, it is difficult to know if they were uttered out of a genuine concern for Hamish's safety and well-being or if they were prompted by economic considerations. Regardless of his motivation, considerably more needs to be done in order to safeguard Hamish's fragile life. The best solution would be to place him in a permanent home with a guardian who would be willing to assume personal responsibility for his care and safety. He still could be afforded a measure of freedom so long as he always has someone looking over his shoulder. If no one in St. Andrews is willing to undertake that sacred responsibility, the job of safeguarding his life falls by default to the citizens of the community. Should they be unwilling to do that out of either compassion or moral responsibility, they at the very least ought to have enough bon sens to act based solely upon the cultural and financial contributions that he makes to the town. The incident with the dogs should have served as a wake-up call to them but there is little evidence to indicate that they fully appreciate just how close they came to losing him. Specifically, if he had not been able to scale that tree, the mood at the April 5th ceremony would have been more akin to a wake than a celebration. It additionally would be both foolhardy and irresponsible for residents to dismiss the attack as an isolated incident. They also should not be lulled into naïvely believing that since Hamish has been wandering the streets of St. Andrews for so long that he knows how to take care of himself. Individuals who hunt cats with large dogs, such as lurchers, are another huge concern throughout the English Isles and Ireland as well. For example, twenty-four-year-old Joshua Varey, twenty-two-year-old Shuan Mullens, and forty-nine-year-old Paul Ashworth, all from Colne in the borough of Pendle in Lancashire, are currently on trial in Burnley Magistrates' Court for using vicious dogs in order to chase an unidentified black cat up a tree. 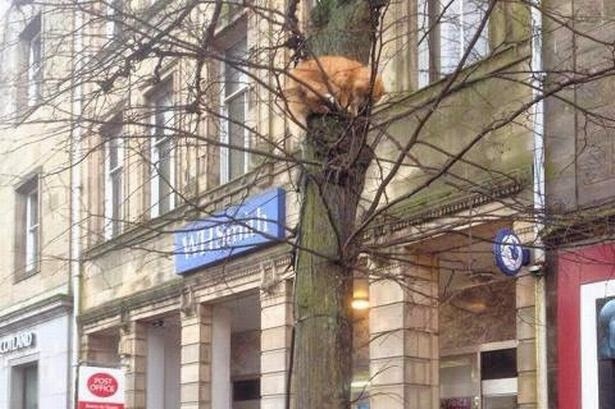 While it is doubtful that cat-hating thugs would be able to get away with such an atrocity in downtown St. Andrews, it is nonetheless an outside possibility. That is especially the case during the evening and overnight hours when the shops are shuttered and the streets deserted. 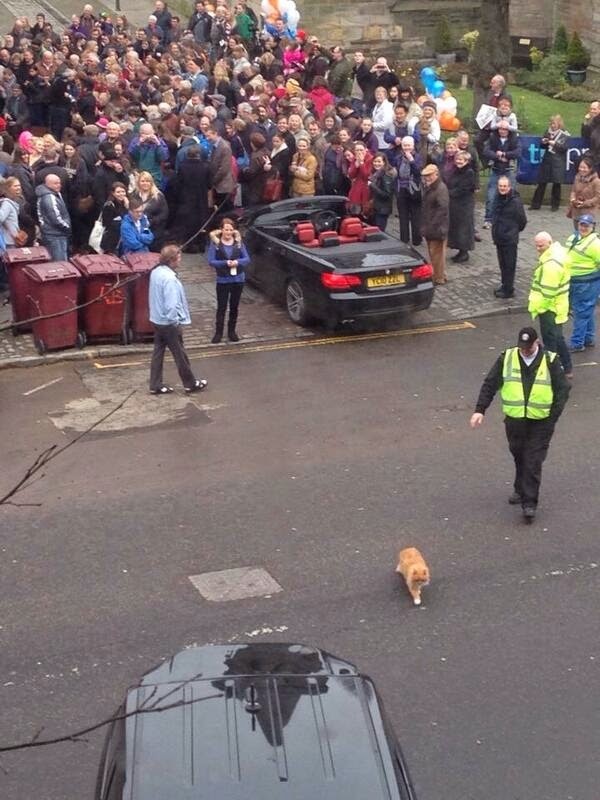 The citizens of St. Andrews also need to be vigilant in order to ensure that Hamish is neither kidnapped nor stolen. That is an especially huge concern when the town is inundated with thousands of visitors every fifth year when it serves as host of the British Open. This year the tournament is being played in Hoylake, Merseyside, but it is scheduled to return to St. Andrews next July. Although it is not known if Hamish's rambles take him anywhere near the Old Course, someone nevertheless needs to make certain that he is not struck by an errant tee shot. Although such incidents are decidedly rare, they do occur ever now and again. 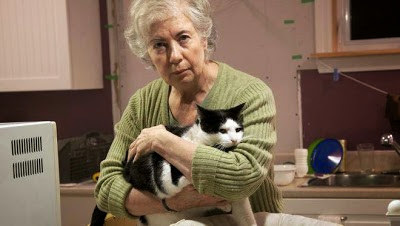 For instance, during the autumn of 2010 Ann-Noreen Norton of Dartmouth in Halifax, Nova Scotia, was lying on her deck with her four-year-old tuxedo, Benny, when he was struck in the spine by a golf ball that came from an unidentified duffer at the adjacent Brightwood Golf and Country Club. The resulting injuries forced him to undergo three months of intensive veterinary care that ended up costing Norton almost C$2,500. Golf courses are additionally hazardous to cats owing to the fertilizers, pesticides, and herbicides that are ladled on them by the gallons. They may look picturesque but they also are toxic. In the final analysis, the overwhelming preponderance of the available evidence strongly suggests that the citizens of St. Andrews are merely exploiting Hamish for their own selfish purposes and as a result care little about either his wants or his pressing needs. The statue, for instance, is of absolutely no value to him and that salient reminder is vividly demonstrated by his total ignorance of both its existence and significance. He cannot either eat or drink it. It does not provide him with any warmth on a cold evening and it contributes absolutely nothing toward his personal safety. By contrast, all the benefits to be derived from its commissioning are destined to accrue to the citizens of St. Andrews. To top it all off, they are so thoroughly incorrigible that instead of being ashamed of their callousness and greed, they are busily trumpeting their baseness to the entire world. Even at this extremely late date and as his days grow progressively shorter, they remain abysmally ignorant as to both his intrinsic value and inalienable rights as a sentient animal. If any of them cared just a little bit about him, they would be willing to move mountains in order to prolong his life and to make his golden years as comfortable as possible. 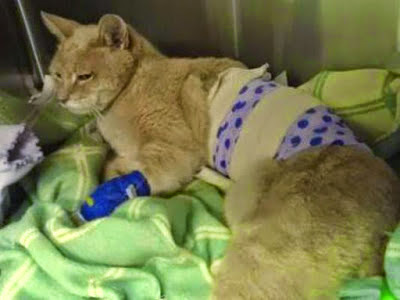 An analogous situation exists in Atlantic City in regard to Alley Cat Allies' (ACA) hideous abuse and naked exploitation of its Boardwalk cats. Even though all of these cats are friendly and preeminently adoptable, ACA has cruelly sentenced them to life imprisonment at the hellish Underwood Hotel. The situation is made all the more deplorable by the fact that the organization is endowed with more than enough resources and expertise in order to place all of them in loving homes. It is not about to do that, however, because in sacrificing their lives and happiness it is able to proclaim to the world the success of TNR. To witness these primarily elderly cats strolling up to perfect strangers in search of the caresses and tuna that they have been denied by ACA is nothing short of heartbreaking. The same holds true in respect to how Americans abuse, denigrate, and nakedly exploit the homeless. Although billions of dollars are appropriated each year supposedly for the alleviation of their plight, just about every cent of it finds its way into the pockets of thoroughly dishonest and thieving politicians, social workers, Christians, and Jews. By contrast, the down-and-out receive almost nothing. Plus, thanks to the excellent job that the capitalist media do in propagating their lies, the world remains largely ignorant of the outrageous crimes of these glorified poverty pimps. Regardless of whether the victims are either cats or the poor, the prevailing prejudice of all societies is to favor appearance over substance, lies at the expense of the truth, and exploitation over compassion. That is not the way that things have to be; it is merely another poignant example of how values become perverted. For as long as that is the case, virtue is destined to remain primarily a private matter. The best that Hamish therefore can expect from his human counterparts is that someone from outside St. Andrews will belatedly come to realize just how special he is and accordingly will intervene before it is too late in order to save him from the machinations of his heartless exploiters. Photos: The Independent of London (Hamish in the street, statue, and his arrival at the ceremony), D. C. Thomson of The Courier (Leishman), St Andrews in Focus (Annand, Sweeney, and Selwyn), George McCluskie of the Express of London (Hamish and McMullan), Amazon (McMullan's book), Daily Record of Glasgow (Hamish up a tree), Lauri Stec (Stubbs), The Chronicle Herald (Benny and Norton), and The Scotsman (Hamish outside a restaurant).